Tiny Montana Firm Gets $300 Million Contract To Help Restore Power In Puerto Rico : The Two-Way The decision by Puerto Rico's electric authority to give such a big contract — and such an enormous challenge — to Whitefish Energy has been met with surprise. The governor has now ordered an audit. 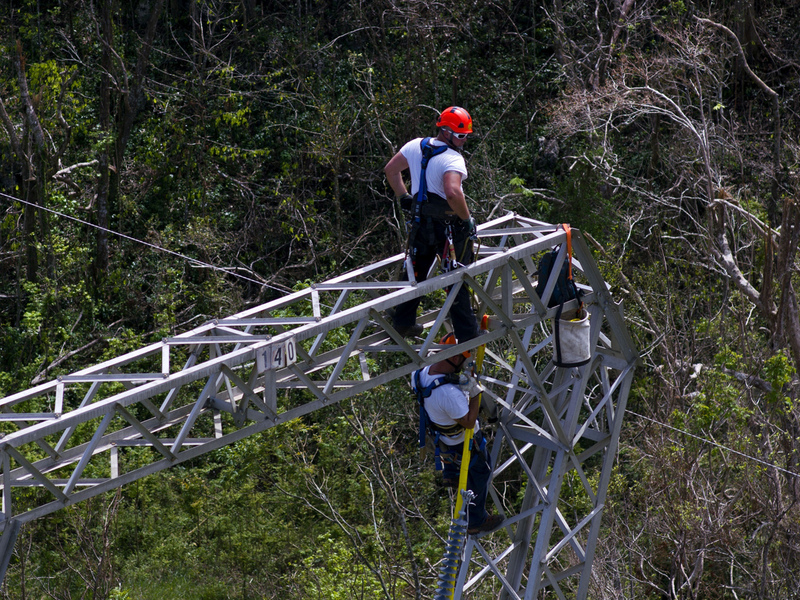 Whitefish Energy workers restore power lines damaged in Barceloneta, Puerto Rico, on Oct. 15. Gov. Ricardo Rosselló has ordered an audit of the $300 million deal the island's power authority made with Whitefish. Last week, a small Montana company called Whitefish Energy Holdings announced that it had been given a $300 million contract by Puerto Rico's electricity authority to help restore the power grid on the island, where some 75 percent of customers remain without power. The decision to award such a big contract — and such an enormous challenge — to a tiny company founded just two years ago has surprised many. Power companies don't generally use contractors to restore electricity but make arrangements for help from other utilities. Puerto Rico's power grid was precarious even before Hurricane Maria made landfall a month ago. But since the storm, the problem is immense. It could take at least six months for service to be fully restored. Whitefish Energy is tasked with rebuilding three to four transmission lines, or more than 100 miles of Puerto Rico Electric Power Authority's 2,500 miles of lines. Montana newspaper Flathead Beacon called it "a windfall for the relatively untested" company. The firm's website offers little detail on the company or its track record. It's based in Whitefish, Mont., the hometown of Secretary of the Interior Ryan Zinke. Its financing comes from two Dallas-based investment groups and a Brazilian company that produces distribution and power transformers. A profile of the company on a site that tracks federal contracts lists Whitefish as having just two employees and $1 million in annual revenue. So why was it given such a big, expensive job? PREPA's chief executive officer, Ricardo Ramos, describes the choice as a matter of timing and convenience. "We knew there was going to be a direct hit, so we wanted as much resources as possible," Ramos told NPR. "Their name popped up on several fronts." Ramos says PREPA received bids from a few companies in the lull between Hurricane Irma and Hurricane Maria. The utility, which filed for bankruptcy in July, shortlisted two, including Whitefish. "Just before Hurricane Maria came, one of those two requested a payment guarantee that we thought was a bit onerous, so we decided to mobilize Whitefish," Ramos says. Whitefish did not ask for a payment guarantee, and it got the contract with PREPA. The company was picked because it was "the only one who was willing to take on the job of restoring power for the people of Puerto Rico after Hurricane Maria," Margaret Jones of LDWW Group, a public relations firm representing Whitefish, wrote in an email. "When they called and needed help – Whitefish went right to work." Usually after a catastrophic power outage, utility companies call a trade organization to initiate mutual aid. The American Public Power Association, of which PREPA is a member, organizes a network of state and regional public power utilities to restore electricity quickly. Meena Dayak, the association's spokeswoman, tells NPR that the mutual aid program is "basically a matchmaking service" — utilities contract directly with one another to provide services and work out payment. That's what happened in Texas after Harvey, and in Florida following Irma. The day after Irma's departure, Florida Power & Light said it had more than 20,000 workers from 30 states and Canada deployed to restore power. But PREPA never asked for mutual aid from the association, and instead it hired Whitefish to handle the job. "Just a matter of the timing," says Ramos. "Hurricane came, all communications went down, our servers were down." Whitefish then subcontracted Jacksonville Electric Authority and Kissimmee Utility Authority to work with it on transmission system restoration. The firm says it now has about 300 workers on the ground. Even Whitefish CEO Andy Techmanski reportedly noted that it's unusual for electrical utilities to work under a contractor. PREPA's decision to contract Whitefish could be a costly one. While the Whitefish spokeswoman says it's "not possible at this time to estimate" the cost of completing the work, the hourly wages the firm is reportedly charging for its contracted workers are eye-popping. "Under the contract, the hourly rate was set at $330 for a site supervisor, and at $227.88 for a 'journeyman lineman,' " The Washington Post reports. "The cost for subcontractors, which make up the bulk of Whitefish's workforce, is $462 per hour for a supervisor and $319.04 for a lineman. Whitefish also charges nightly accommodation fees of $332 per worker and almost $80 per day for food." UTIER, the electrical workers' union of Puerto Rico, tweeted its consternation at those rates. "We need support and help, but under these conditions it is impossible and questionable. Who allowed this?" The firm's spokeswoman told NPR that while this is Whitefish's first job in Puerto Rico, the company brings experience in maintaining and repairing transmission lines and working in mountainous regions. A recent project in Washington state included using helicopters in the rebuilding of a distribution line destroyed by forest fire, she said. Techmanski told Bloomberg that while other utilities "are all afraid of the question of how are we going to get paid, Whitefish Energy was the company that actually made the leap of faith and was able to get over here." On social media, Whitefish is energetic about its work, posting videos of a crewman dangling from a helicopter with exciting music in the background. But Whitefish also says it's having a hard time accessing work sites because of debris. PREPA says it has paid Whitefish $2 million so far for its mobilization and work through Oct. 11. At least at the outset, Whitefish's bills will likely be paid with money from FEMA, which on Monday announced more than $215 million in assistance to PREPA. Whitefish could be paid up to $300 million for the work. Puerto Rico Gov. Ricardo Rosselló told the Post that of the $490 million the commonwealth expects to spend on restoring power, "a large portion of that would probably go to Whitefish" and another contractor. But Puerto Rico doesn't have money to burn. The commonwealth could run out of money as early as the end of the month, the Post reports. The House Committee on Natural Resources told NPR Tuesday that it plans to discuss the contract at an upcoming hearing. "The size and unknown details of this contract raises numerous questions," said Parish Braden, a committee spokesman. "This is one of many things the committee is taking a close look at as it continues to work with the resident commissioner, governor's office, and oversight board to ensure Puerto Rico's recovery is robust, effective and sustained." Late Tuesday afternoon, Rosselló said he had ordered his Office of Management and Budget to audit the Whitefish contract and others made by PREPA for power restoration. Contracts, Rosselló said, would have to both meet FEMA's standards and comply with the budget office's audit to ensure "the processes have been carried out correctly in this and other circumstances."